The vehicles are the most high profile items in the Museum's care. Additionally, however, we have been acquiring artefacts to support the vehicle collection. Many of these are not suitable for constant display but are brought out on suitable occasions. The museum has a great deal of pressure on its finances with many vehicles still awaiting restoration. Therefore we are always grateful when artefacts are donated to the museum. Sometimes this happens when people are concerned about the treasures they have preserved over the years and therefore make provision in their wills. 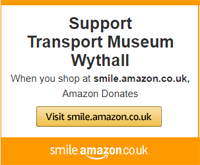 If you have similar concerns, please think about a suitable museum such as Wythall for them. If you would like some advice, please do get in touch with us. Likewise, if you feel that you could help with cataloguing or restoring our smaller exhibits, we're waiting to hear from you.